"It’s A Bomb That’s Dropped On You." "Rhyan went from playing in the cul-de-sac to having stage four cancer in 48 hours." It's a situation that so many parents of childhood cancer patients can relate to. And it was that way for 6-year-old Rhyan Loos or Missouri. 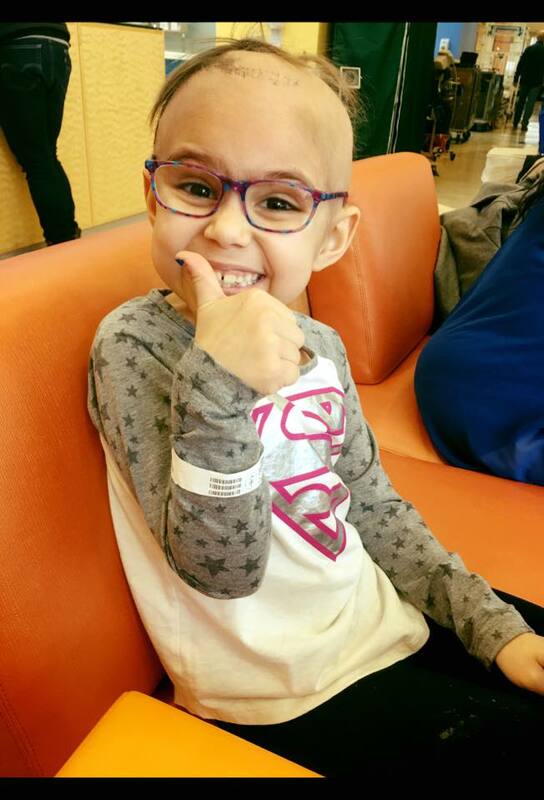 We spoke with Rhyan's father, Brad, about their experience fighting Rhyan's cancer and the incredible platform they're leveraging to help raise money for childhood cancer research. What made you first suspect something might be wrong with Rhyan? Rhyan was always an outgoing kid. She loved preschool. After starting kindergarten, she became real apprehensive about going to school and didn’t want to leave my wife. She was just off and we couldn’t explain why. Then she started having a limp that would come and go. We took her to the doctor, but he couldn’t find anything wrong, so he suggested seeing a specialist. The specialist said it’s likely juvenile arthritis, but she could be septic so let’s keep her overnight at the hospital just in case. When they did an MRI the next day, they found a tumor in her hip. They then looked elsewhere in her body, and found cancer everywhere. She had stage four neuroblastoma in her kidney. It’s a bomb that’s dropped on you. Rhyan went from playing in the cul-de-sac to having stage four cancer in 48 hours. They thought it was leukemia which has a good cure rate, but then we learned it was neuroblastoma. I couldn’t even spell it when I first heard about it. So many parents have to uproot their lives to get their children treated. Was Rhyan able to be treated locally? We went through induction chemotherapy at the Columbia Children’s Hospital. That stabilized the cancer, but wasn’t getting rid of any of it. That’s when we started talking about surgery to remove the tumor. We learned about Sloan Kettering in New York City and went there to get the tumor removed. Once we learned more about the hospital, we decided to stay there. We started a form of immunotherapy which went well and led her to having no more evidence of the disease. It's interesting. We were feeling very fortunate to be at Sloan Kettering. It's very cutting edge. It's neat to be so cutting edge and it’s interesting because things change on a daily basis on these treatments. It's exciting, but it's also scary because we just don't know. These doctors just don’t know. Our kids are the guinea pigs. We're learning every day, but we just don't know. But, it wasn’t over yet? Tell us about her recurrence. Everything was going well. But around last Thanksgiving, Rhyan began having random headaches. We found out on Thanksgiving morning that she had relapsed with a brain tumor. We got a Life Flight to Sloan Kettering a day later and Rhyan had brain surgery to remove the tumor. Then, it was chemo, radiation and immunotherapy all over again. Now, there’s no evidence of the disease. I’ve spoken to a few childhood cancer patients and they have this amazing inner strength. How has this experience impacted Rhyan? It’s great to see how mature she is and great to see how well she handles things. But, it’s sad in a way because she’s not as care-free as her friends are. All these kids with cancer, they lost a lot of their childhood. Rhyan’s case got an unusual amount of local media attention. Tell us about #RallyForRhyan. I was a college basketball coach for 15 years and an assistant coach at the University of Missouri. When the story broke, it got a lot more media attention than just for a normal kid. People all of a sudden wanted to help out. People set-up a Go Fund Me page. Meanwhile, I’m looking across the hall in the hospital at a mother who is struggling. She’s trying to afford gas money. It just wasn’t right that we’re getting all of this attention. My wife and I thought about how we could use our platform to make an impact. We started a fund to raise money for pediatric cancer. We took all the money that was coming in and put it in this fund. Then, someone created the hashtag #RallyForRhyan. Since then, #RallyForRhyan has raised more than $100,000 for pediatric cancer research. Why did you get involved with ACS CAN? Tim [ACS CAN’s Missouri grassroots manager] walked up to me at church one day. Tim is a very persuasive guy. He said this is what we do and asked me if I wanted to be involved. He sent me to Jefferson City to meet with lawmakers. Then I went to Washington, D.C., for an event. I thought I understood how the government worked. To say it’s organized chaos is an understatement. It’s been very eye-opening to me. The fact we have a platform due to my former job as a coach is a gift. I realize this platform won't last forever, so we need to take advantage of it while we can. The legislators in Missouri know Rhyan’s story. We can use this platform to better the lives of all children with pediatric cancer. Why should people get involved in advocacy? I can remember vividly sitting on the couch and watching a children’s cancer commercial pop up on TV. You think it's sad and then change the channel. But, that's a child in your community, a cousin, our daughter. It's not just a sad commercial you're going to turn from and is going to go away. We're getting better. The cure rate for childhood cancer is getting better every day. The medicines are getting better. But, the medicines they're using have long-term secondary effects on these kids. My daughter is going to wear hearing aids the rest of her life because of the treatments we used to save her life. We're putting these kids’ lives at risk to save their life. We can do better than that. This lifesaving legislation will aid in the development of new treatments and improve the quality of life for kids not only while they receive cancer treatments, but throughout the rest of their lives.